Humans aren't the only animals who like to hang out with their friends. 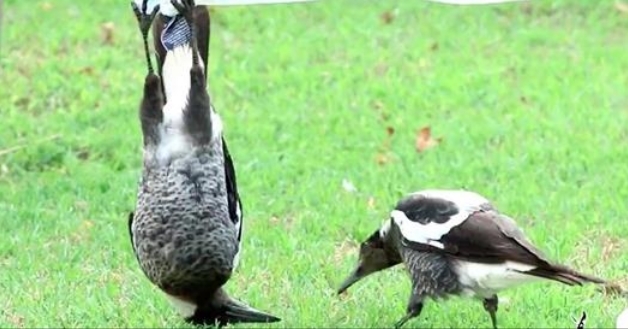 In a video making the rounds on the internet today, two Australian magpies make a jungle gym out of somebody's backyard, and one of the birds decides to go for gold by hanging from a towel, what else? Holding his body up by his feet in the style of a bat, the magpie looked at the world with an entirely new perspective. His friend paused, stared at him, then hopped around to investigate his ... genius. Described as one of Australia's most accomplished songbirds, the Australian magpie has an array of complex vocalisations. It is omnivorous, with the bulk of its varied diet made up of invertebrates. It is generally sedentary and territorial throughout its range. Common and widespread, it has adapted well to human habitation and is a familiar bird of parks, gardens and farmland in Australia and New Guinea. Responses to "Bird Has No Idea What His Friend Is Doing Right Now"
Got my husband to watch. Reminded us of our Magpies. Sat right back and laughed.